Laurenz Capodimonte Mickey starring Mickey, Minnie, Donald, and Clarabelle Cow. Size: 13 1/2 inches High by 15 inches Wide by 11 inches Deep. Details: Although he is a senior citizen, Mickey's captivating qualities transcend time and cultural barriers. To his countless fans, he will be forever young. 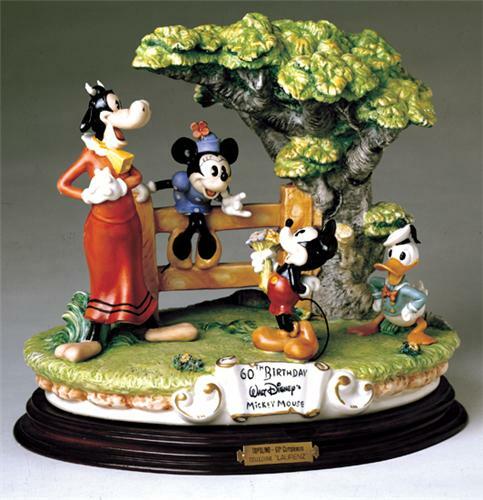 In this delightful sculpture created to commemorate his 60th birthday, Mickey is surrounded by his cohorts: an admiring Minnie, the attractive bovine Clarabelle Cow, and the effervescent Donald Duck. Vibrant colors add to the feeling of merriment and camaraderie. All the characteristics and quirks that have endeared this zany bunch to generations of audiences are preserved in the finest porcelain. This exquisite porcelain Capodimonte sculpture is from the Disney Laurenz Classic Collection. limited edition of: 192 pieces total made world wide. This is the Rolls Royce of Porcelains. This was created by Enzo Arzenton. He is an Italian sculptor who suddenly took ill and closed his shop in Italy. He did all the molds, fired all the pieces, and hand painted all the pieces to his perfection. This is truly a work of art.